As we piled on the bus, we asked the driver how much it would be for us and our luggage. He said that he'll just make us pay for four seats, which is 24,000 dong (about $1.20 USD.) We attempted to give the driver a 500,000 dong note (the lowest note the ATM would give us), but he looked at us annoyingly and shook his head. Apparently he didn't have enough change to split it. So we frantically asked around for change and luckily Mary, a student who flew with us on the plane, backed us up and said we could just pay her back. Crisis averted. We continued to the back of the bus, sat down, and made our way to the Blue Diamond Hotel. Sophie was still in her backpack and I seated her next to the window so she could look out at all the cool things to see. 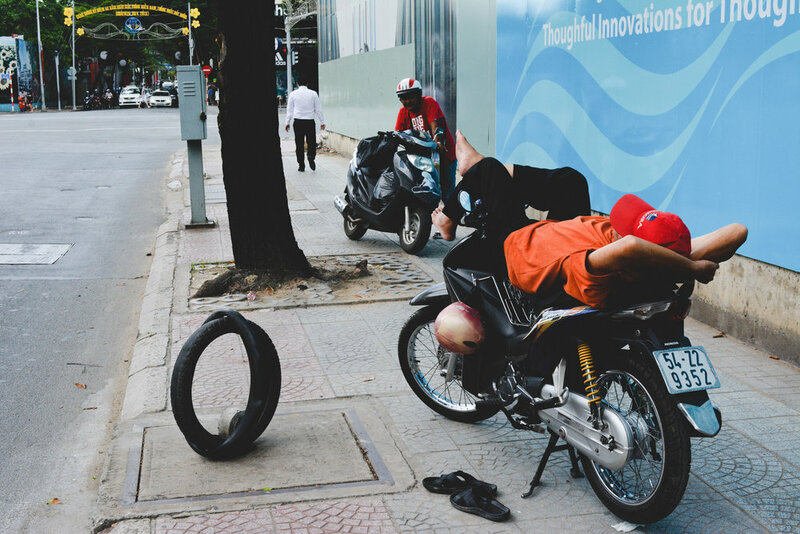 Vietnamese culture is way different from any other culture I've experienced. After living in Russia for multiple years I'm used to seeing dirty streets, crazy drivers, street vendors, and open air markets. But this was a totally different experience. Pretty much everyone here drives a scooter. They buzz around like bees, weaving in and out of traffic. Most are lugging cargo three to four times their own weight, or potentially even more (we have a contest going of who can take the craziest picture of scooter cargo). There are tropical plants everywhere and fruits I never even knew existed. 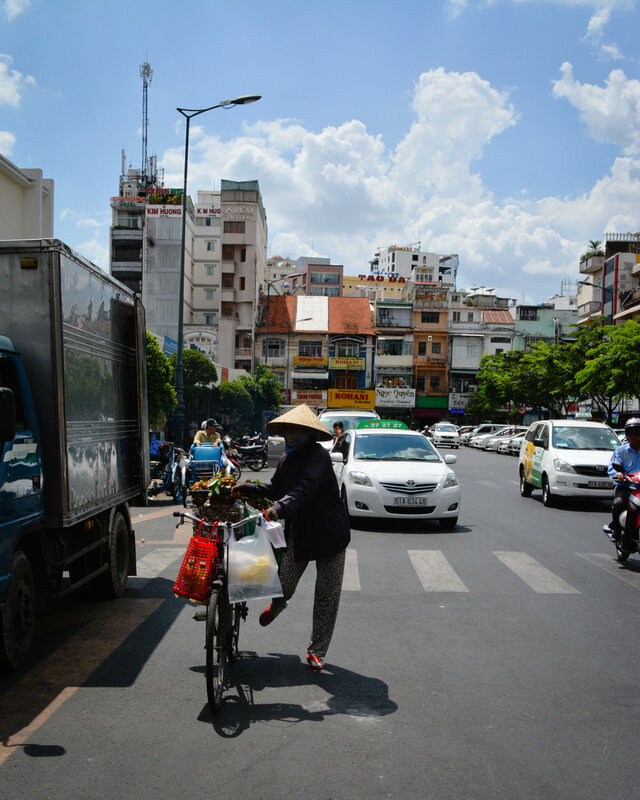 Adorable old men and women with their straw Vietnamese hats riding down the street on their bicycles, locals lounging in the shade drinking tea or smoking a cigarette. Even though everyone is in a hurry to get somewhere, they still seem calm, chill, and lackadaisical. 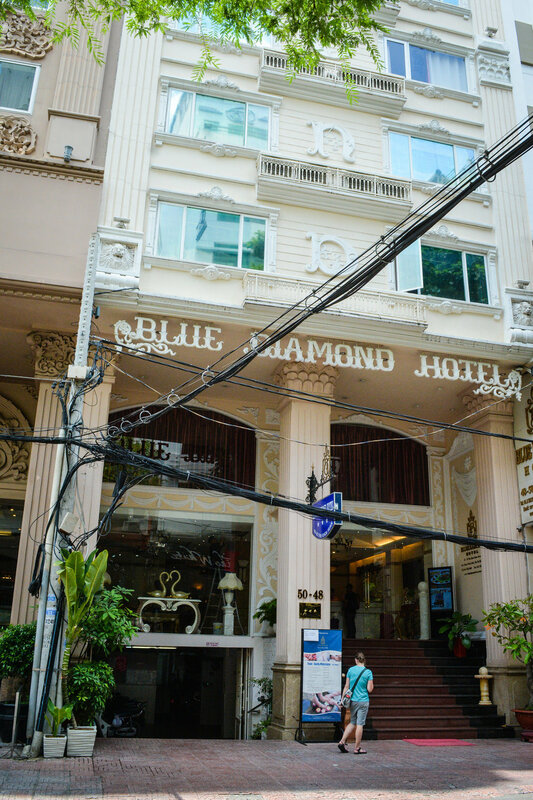 When we reached the end of the bus route, with the help of some kind Australians pointing us in the right direction, we made our way to the Blue Diamond Hotel, which happened to be another few more blocks. 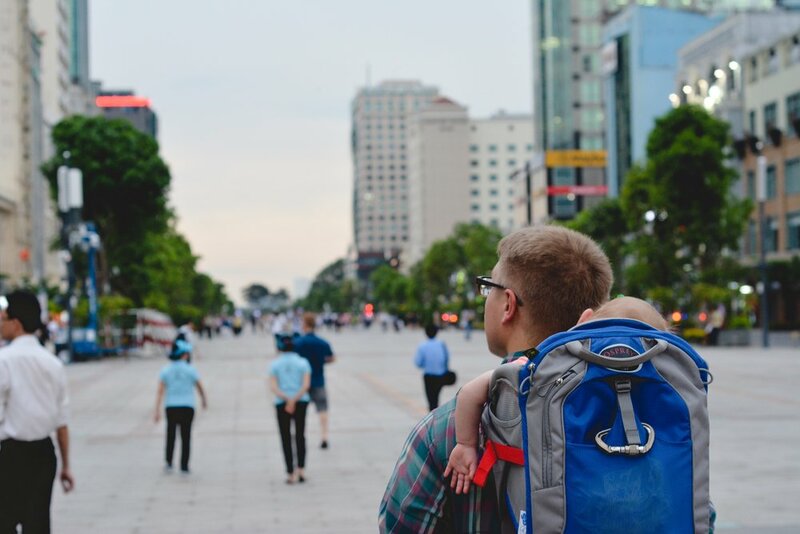 I can't tell you how fun it was to haul all our luggage (roughly 140 lbs including Sophie on my back) over unfinished, crowded side walks and cross busy congested streets. It was an adventure indeed! We finally made it to the hotel in one piece with the only casualty being Danny's beloved Klean Kanteen water bottle he had bought at REI right before we left. Poor Danny was devastated. It must have fallen out of his backpack on the way to the hotel. The hotel was a breath of fresh cold air. Literally. The AC was amazing! Kind of the same feeling you get when jumping into a pool after you've been boiling in the hot tub for a while. The hotel staff were very accommodating and helped us carry in our luggage. The lounge area was quite fancy with marbled floors and vintage looking furniture. It was a nice change to the stuffy planes and crowded buses we took to get here. 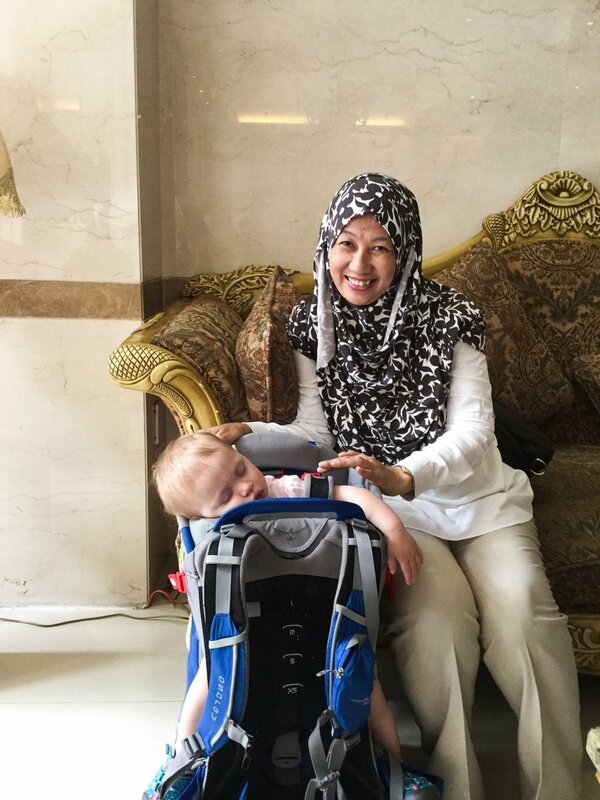 While we were waiting in the lobby to get checked in this sweet Malaysian lady asked if she could take a picture of Sophie. She was the first of many to take their picture with her. So we can keep track of all of Sophie's fans, we ask if we can take a picture of them together too (check out #sopheastasia on Instagram). We took our bags upstairs and set out to find a place to eat lunch. We ended up eating at the famous Pho 2000, where Bill Clinton ate when he came to solidify political relations with Vietnam. Sophie was adored by all the waiters and waitresses as you can see in the photo below. The food was delicious! I got Bun Cha, which is a grilled beef and rice noodle dish served with fresh herbs and soup-like dipping sauce. Danny got Pho Bo (beef). The total bill was $6.40 for the both of us. Not bad for a tasty and filling lunch for two (well more like 2.5 if you include Sophie). Sophie loves the food here! There hasn't been any food that she's spit out, even Danny's spicy food. After lunch we walked around town and did some sight seeing. Here are some of the places we went. You can't actually go in the building, but it's pretty to take picture out side. It was built in 1908 and was designed after a hotel in Paris. I love the way it looks at night when it's all lite up. 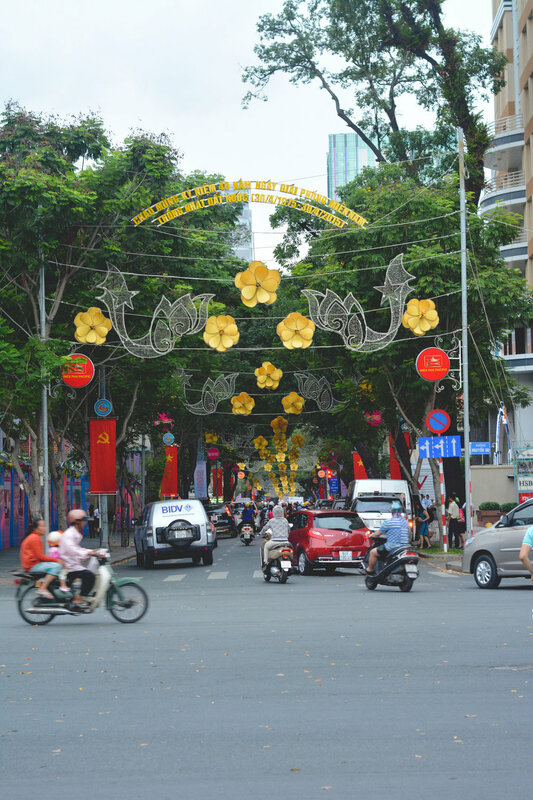 A must see when visiting Ho Chi Minh City. 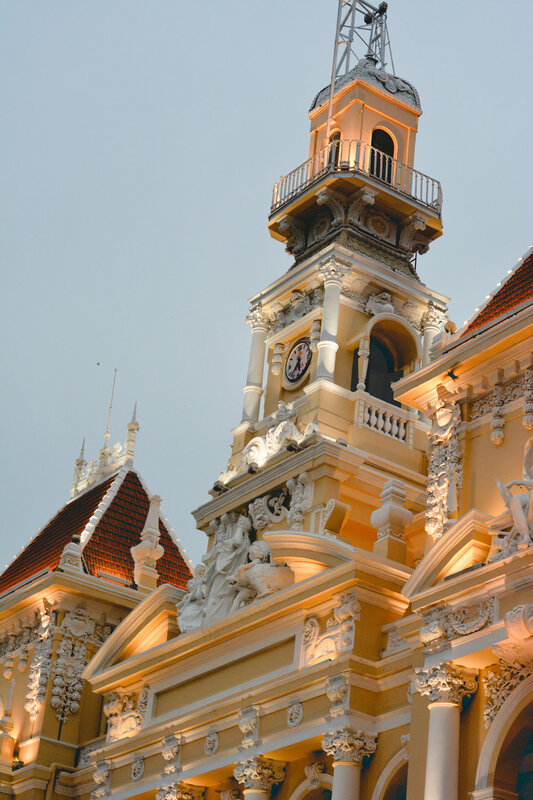 Another beautiful French colonial building that looks amazing at night. It was built in 1897 and in 1955 was transformed into South Vietnam's Assembly House and then turned into a theater in 1975. It's only open to the public during events and its most popular performance is the AO Show, a Vietnamese acrobatic show, costing around $65 a ticket. We wish we would have had the time/money to go see it. The trailer makes it look pretty epic. 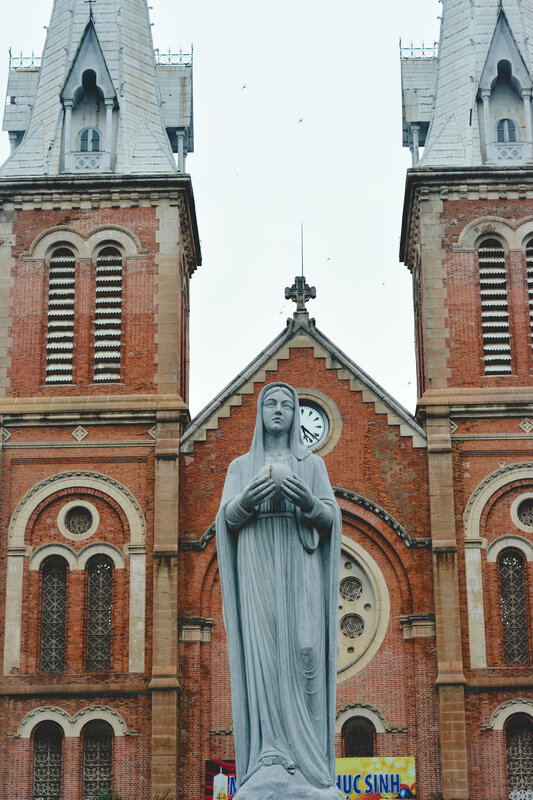 This cathedral was established by French colonists in 1877. 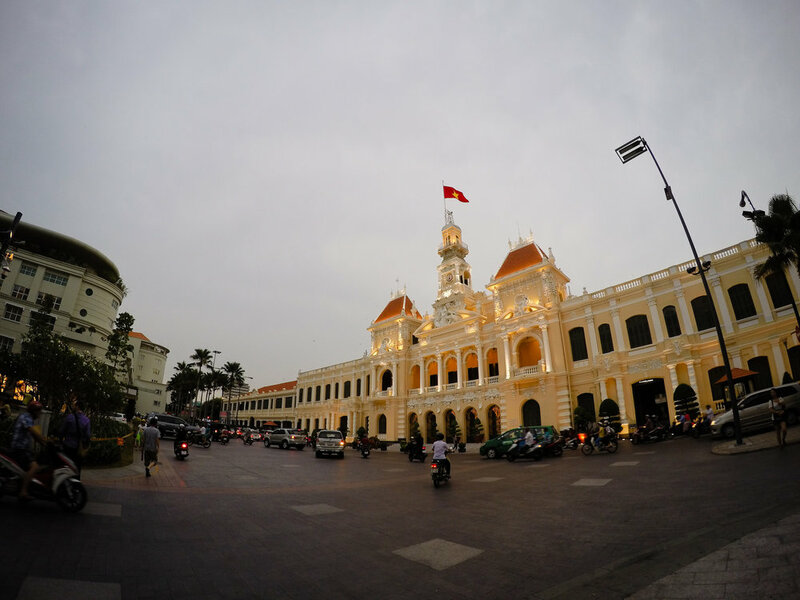 It threw me off a bit seeing all these French-styled structures in Vietnam, but then after learning more about the French colonization of Vietnam it made more sense. This was a very busy tourist spot with many street vendors surrounding the perimeter.